← gluten free brown sugar cookies – just in time for St. Patrick’s Day! Mix together and store in an airtight container for up to a month. Add by the teaspoon to a cup of sour cream until you reach your desired strength. Let sit for 10 minutes in the refrigerator to let the onions soften. Use as a rub to flavour beef. Adding a bit of cornstarch will aid in browning. Add a teaspoon or more to a cup of hot water and stir. For better colour and richer flavour, add a pinch of instant coffee – yup, I said coffee. You’ll be surprised. If you are avoiding caffeine, add a pinch of gluten free bouillon powder. Add 1 Tablespoon to ¼ cup ketchup, 2 Tablespoons water, and 2 tablespoons brown sugar. Mix together and brush onto chicken. Bake in 350 degree oven until done. Add some to the hamburger before forming into patties. Thanks to Rural Route Lupiac who posted this awesome idea in the comments below! LET US KNOW HOW YOU USE GF ONION SOUP MIX IN THE COMMENTS BELOW! This entry was posted in Lunch and Dinner, Recipes and tagged beef, celiac, coeliac, cup-of-soup, dairy free, dip, GF, gluten free, gluten free in Red Deer, recipe, sauce for chicken, vegetarian. Bookmark the permalink. I love the different ideas you gave for its uses! You’re so welcome! Glad you enjoy it! This is amazing! I’m going to grab some onion flakes and try this over the weekend. I’ve been looking for a really fast soup base. Thanks!! What an awesome idea! Why didn’t we think of that! Founds this on another blog. Looks delicious! Thanks so very much for the link! I bet you could store this in the freezer without problem and it would keep for a long long time! 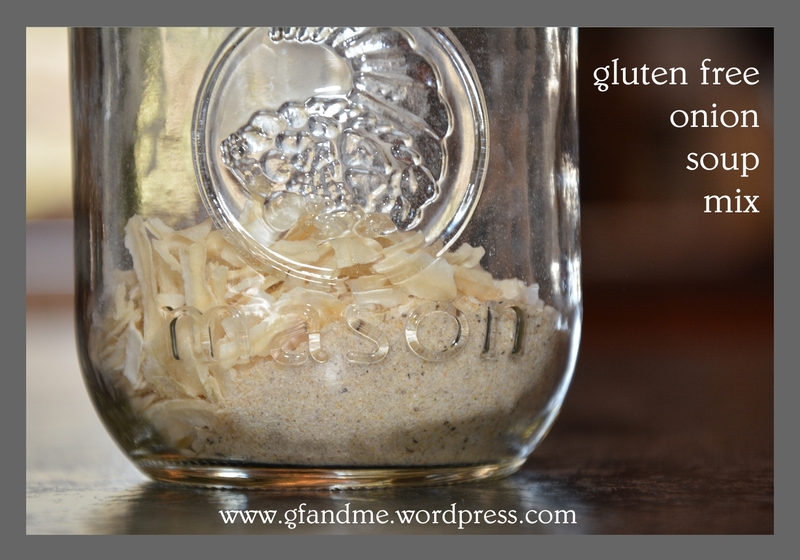 Hello Dear!Thanks for sharing recipe for gluten free soup mix.I really need it.These tips are really amazing. I appreciate it for sharing them.Thanks…. Pingback: Spinach & Cashew Cream Dip | Feed My Family! Thanks so much for the shout out! Sounds fantastic!